My friends, today is a religious holiday. And, as I have for the last 30 years or so, I will be attending a house of worship with my sons, Josh and Ben. Every year, Linda and I would pull them out of school on this day and we’d all head to the ballpark. Their principal would give them a dollar and ask them to bring him back a bag of peanuts. Never mind that a bag of peanuts cost around six bucks . . . He got it. And we brought him back the peanuts. I said then — and I say now — that there was nothing they would miss in class that day that would be as important or as meaningful as this family tradition. Today is Opening Day, and I’m heading to the ballpark. There will be hot dogs. There will be beer. I don’t care if I never get back. And here’s the best part . . . This year my sons are taking ME! Great memories last a lifetime. 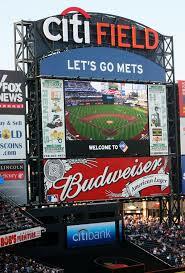 Let’s go Mets!